It seems like a daily occurrence that someone asks me about starting a yoga practice. So I figured I would create a post for anyone who is thinking about starting a yoga practice but doesn’t know where to start or feels intimidated. When I started my practice I felt totally out of my element. For starters, I was the least flexible person I know. I was nowhere near being able to touch my toes, seriously Y’all, my forward fold was the worst I have ever seen and that is saying something after teaching yoga for six years. Not only was I far from flexible I had a bunch of injuries and limitations. I couldn’t hold down dog pose for more than a few seconds, I spent a lot of time in classes resting in child’s pose. And quieting my mind was super intimidating. I was at the beginning of my recovery and healing journey after seventeen years of battling my eating disorder, body dysmorphia, PTSD and abusing my body through over-exercising. I share with you my very modest beginnings because I want you to know wherever you are on your journey yoga can help you. It is about so much more than the physical practice of yoga. There is an entire eight limb practice that can help you transform your life. These are the things I wish I had known when I started practicing yoga. They are also the tips I most often share when people come to me asking for advice about starting their yoga practices. I hope you will find them helpful when you decide to start your yoga practice. 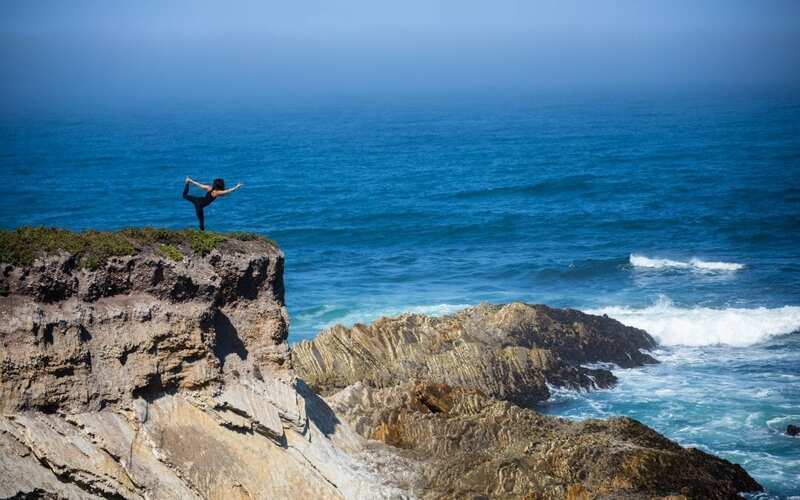 It’s easy to get caught up in what you think Yoga should be. Especially with all the beautiful yogis on Instagram who take and share photos of themselves in crazy poses. Let me ease your mind, that is not what yoga is about. The word yoga translates to union or to yoke. toga is designed to help you connect to yourself and the divine. In fact, the yoga sutras say that the physical practice of yoga should be a balance of steadiness and ease. So really it’s not about what you are doing it’s about the mindset you have when you are practicing. So don’t worry if you can’t do the perfect warrior two or eagle pose is just not attainable. right now. Because yoga isn’t about the poses it’s about who you are while you are practicing them. I am a big advocate of my students having diverse practices. Don’t be afraid to try different styles of yoga classes. It is always a good idea for new students to start out with a beginner’s class, this will help you build a strong foundation. I also recommend trying yin yoga, restorative yoga, and Yoga Nidra classes. This will give you a good base for starting your yoga practice. I believe yin and restorative practices are important because they are the opposite of our modern lives. These styles of asana give us the opportunity to go inward, to relax, and to let go and embrace stillness. I’m pretty sure we can all benefit from those things. Have fun with your practice try out classes with different teachers and check out different studios. Find the styles and places that most resonate with you. Once you are confident enough I highly suggest adding in a home practice as well. Trust me on this one there is nothing worse than getting into your first down dog pose and feeling the contents of your stomach shift. I have been there its not very fun. Do your best not to eat for at least two hours before you step on to your mat. Leave the digesting for your time off the mat. Committing to your practice will allow you to experience all of the amazing benefits of yoga sooner. It is ideal if you can practice asana at least three to five times a week and start meditating for at least a few minutes per day. My students always want to know how long it will take before they are able to do certain poses or be able to meditate for long periods of time. And my answer is always the same, it depends on how much time you devote to your practice and it depends on your body. It took me a year of practicing daily to be able to do half moon pose away from a wall but I have had students who were able to do it their first time. Your practice will be unique to you. Honor your journey and your body, by listening to your body as you practice. Never force yourself into anything your body doesn’t want to do. This is the quickest way to injure yourself and halt your practice. Yoga was originally taught in a one on one setting, that way each student was receiving a practice that was custom tailored to meet their unique needs. Unfortunately, this is not really the case anymore, because of the way the yoga industry has evolved in the west. Don’t get me wrong I love practicing in studios with groups and I love teaching groups but it is just not the same as a private class or doing a class that was designed specifically for your body. When you work one on one with a teacher you are getting a practice designed just for you instead of a generic class designed to be accessible to a wide variety of people and skill levels. Having a personalized practice helps you get more from your yoga practice and it also allows you to get the benefits of the practice much more quickly. It also will help you feel much more confident when you are practicing because the teacher is there just to help you so you receive their undivided attention. Which you never get in a group class setting. I know from personal experience that having this one on one time was huge for my practice. It really allowed me to go deeper and have a much better understanding of asana and pranayama practices. I have also seen it greatly impact my student’s practices and lives. Which is why I’m such a believer in students having personalized home practices as well as practicing in studios. If you can find a teacher in your area that you like and you can afford private lessons, it is certainly something to consider. I also offer a personalized yoga package to students where I learn about their goals, body, and lifestyle and then create a practice just for them. If this is something you would be interested, you can learn more here. I work with students all over the world, so you don’t have to live near me for us to work together. Whether it is making friends at your local yoga studio or joining an online community, having other people who are on the same path as you make a difference. When you have questions about your practice or want to discuss certain experiences or principles it is really nice to have friends to talk to. One of my favorite parts of teaching and running yoga studios was the community. I got to meet and develop relationships with some really amazing people I might not have met otherwise. I have also found some really amazing communities online as well. If you live in a small town like I do being a part of online communities can be an excellent way to meet other people who are also committed to their yoga, personal growth, and spiritual practices. If you are looking for an online community I would love to have you join mine here. As you begin your practice you will feel drawn to certain styles of asana practice, meditation, pranayama, and texts. Trust your intuition and try out these different things. You are drawn to them for a reasons try not to second guess yourself. Especially if the things you find yourself being drawn to are outside of your comfort zone. This is your soul guiding you in the right direction for your growth and evolution. When I first started practicing the yoga studio I practiced at had a chakra workshop that I was drawn to. It was totally outside of my comfort zone but I choose to go anyway. As a result, I learned a ton and I ended up meeting a really awesome older man who had been practicing yoga for over forty years. when we were talking he recommended that I read the book the four agreements. I took his advice and read the book. To this day that is one of the most impactful books, I have read. So much so that I encourage everyone I know to read it. too never know where your intuition is going to lead you. I find it always leads me to exactly where I am meant to be. 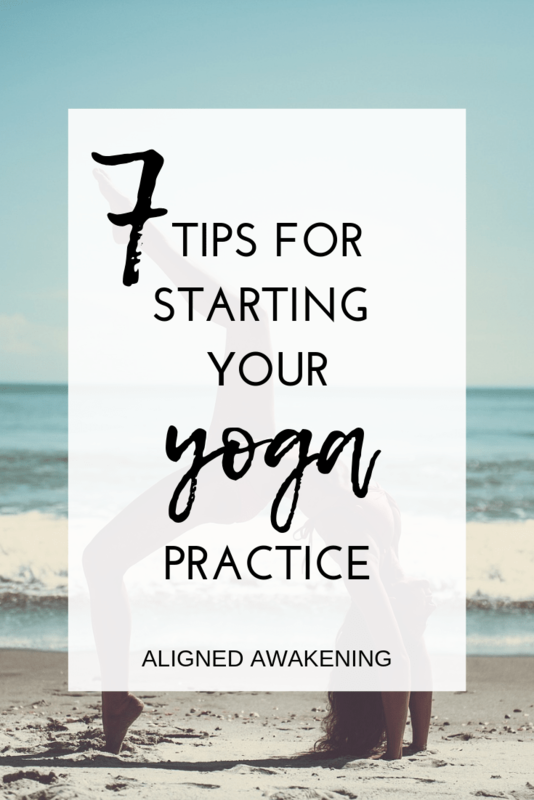 I hope that these tips are helpful on your journey and they help you feel less intimidated and overwhelmed starting your practice. If there is anything I can do to help you please feel free to reach out! I make sure to read every single email I receive. As a true yoga lover, I really enjoyed this post! All of your advice is spot on! One of my favorite things about creating a yoga practice is that it’s uniquely yours! It looks different for everyone! Right!!! It is totally yours and is about you and no one else! I love being able to get on my mat and just tune into what my body wants and just let it flow. So glad that you enjoyed the post. I love yoga and also Im New this maybe could help me grow in this. Thanks!!! So glad that you found it helpful! If I can help you on your journey at all feel free to reach out. Your writeup is so true! I was intimidated at first, but now I can’t live without yoga! Thank you so much Lissy! I am so glad that you enjoyed the post and I am so glad that you love your yoga practice! These are some awesome tips Ali! Thanks for sharing. Also, I wanted to let you know I am nominating you for the Mystery Blogging Award! Woohoo! My post will go live tomorrow. Thank you so much Stephanie! I am so glad that you enjoyed the post! If I can support you in your yoga journey at all let me know. Wow! Thank you so much I will have to check out your post and learn about the mystery blogging award!